Geo-Writing returned recently to Brighton - and Beyond! Geo-Writing invited you to grab writing prompts based on your location, wherever you were in the world! Centred around Brighton - where there were a higher intensity of prompts - but then rippling outwards, the prompts based on your location could be worked on straight away or emailed to yourself to work on at leisure. 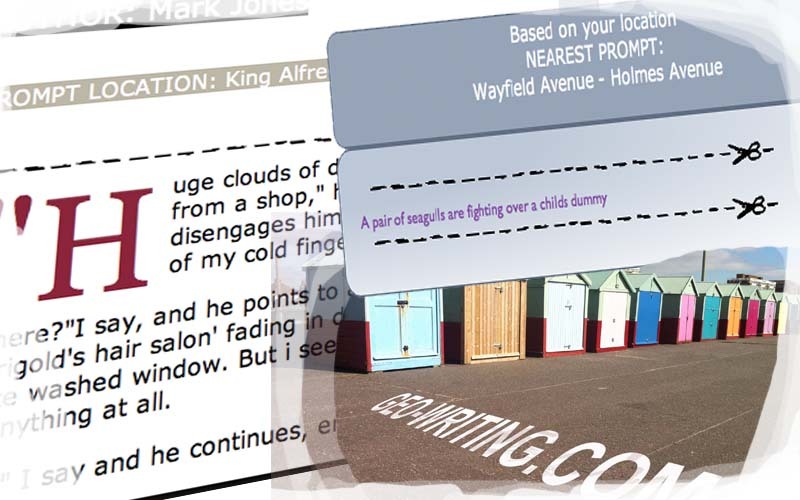 Authors used these prompts to write a fragment of a story, and submit to become part of a multi-authored ill-fitting story patchwork created during the Brighton Digital Festival. Sometimes, the same prompt was twisted through various viewpoints, other times characters and motifs featured in more than one tale. READ THE STORIES NOW! HERE! In the meantime, sign up for the newsletter, follow on Twitter or Facebook for updates on future and related events. Please note:(After completing this form, you will be returned to the home page).